Today, railing is from my desktop. WSOP is streaming it live. 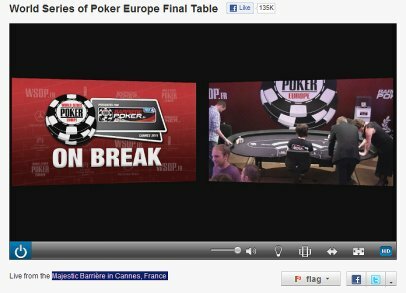 Go to WSOP.com and click on the right (LIVE FROM FRANCE). The final tables that are playing will display. Choose the one you want to watch. If there is only one, you will be taken to that final table. Here’s what I see when they are on break.